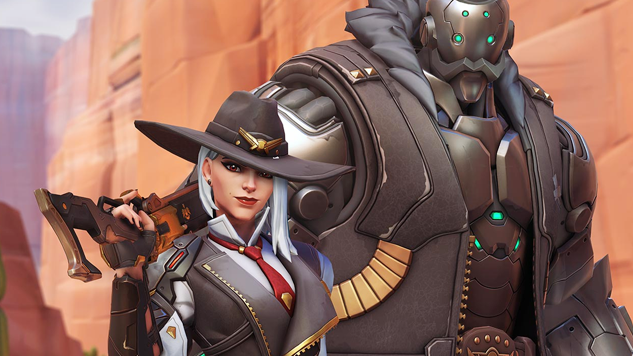 Ashe Is Overwatch's 29th Hero, as Revealed in New Short "Reunion"
At BlizzCon 2018 on Friday, Blizzard Entertainment revealed Ashe as Overwatch’s next hero. She is first shown in the latest Overwatch short titled “Reunion,” which introduces several characters. However, it’s Ashe, B.O.B and an omnic named Echo who are the most notable, alongside the cowboy everyone knows and (sometimes) loves, McCree. “Ashe is the ambitious and calculating leader of the Deadlock Gang and a respected figure in the criminal underworld,” reads the first line in Ashe’s biography on the official Overwatch site. The 39-year-old thief’s actual name is Elizabeth Caledonia “Calamity” Ashe. Ashe is an outlaw legend who will be the latest addition in the game’s Damage category. Her main weapon is the rifle, but she also uses techniques like blasting enemies by throwing dynamite, using her coach gun to put some distance between herself and her enemies, and even calling on her ally B.O.B for her Ultimate so that he can help push the payload or capture the point. Watch the new short and Ashe’s gameplay trailer below. No specifications in regard to her release on the PTR have been revealed thus far.